[165 Pages Report] The overall Enterprise WLAN Market is expected to grow from USD 5.53 billion in 2016 to USD 21.10 billion by 2021, at a Compound Annual Growth Rate (CAGR) of 30.7%. Moreover, technological advancements is expected to increase WLAN applications in numerous industry sectors. The growing demand of mobility and cloud applications and the emergence of Internet of Things (IoT) is driving the deployment of enterprise Wireless Local Area Network (WLAN) market and upgrades of enterprise networks. This market is witnessing a surge in deployment due to high demand of WLANs in different verticals, as it supports numerous business-critical mobility applications. Deployment of WLAN through cloud reduces the WLAN cost and enables the companies to enjoy more security and flexibility. The overall market has been segmented by component, hardware, software, service, and vertical. This study has been done on a global level covering four regions broadly, namely, North America, Europe, Asia-Pacific (APAC), Middle East and Africa (MEA), and Latin America. The main objective of this report is to define, describe, and forecast the global market on the basis of component, hardware, service, software, vertical, and regions. The report provides detailed information about the major factors (drivers, restraints, opportunities, and industry-specific challenges) influencing the growth of the market. The report aims to strategically analyze the micromarkets with respect to individual growth trends, prospects, and contributions to the global market. The report also attempts to forecast the market size of the 5 main regions: North America, Europe, Asia Pacific (APAC), Middle East and Africa (MEA), and Latin America. It strategically profiles the key market players and comprehensively analyzes their core competencies. It also tracks and analyzes the competitive developments, such as joint ventures, mergers and acquisitions, new developments, and Research and Development (R&D) activities, in the market. The research methodology used to estimate and forecast the market begins with capturing data on key vendor revenues through secondary research such as the Crunchbase. The vendor offerings are also taken into consideration to determine the market segmentation. The bottom-up procedure was employed to arrive at the overall market size of the global enterprise WLAN market from the revenue of the key players in the market. After arriving at the overall market size, the total market was split into several segments and subsegments, which are then verified through primary research by conducting extensive interviews with key people such as CEOs, VPs, directors and executives. The data triangulation and market breakdown procedures were employed to complete the overall enterprise WLAN market engineering process and arrive at the exact statistics for all segments and subsegments. The enterprise WLAN ecosystem comprises solution and service providers such as Cisco Systems (U.S.), Juniper Networks (U.S.), Alcatel Lucent Enterprises (U.S.), Aruba Networks (U.S.), Ruckus Wireless (U.S.), Aerohive Networks (U.S.), Allied Telesis (U.S.), Avaya Corporation (U.S.), Dell (U.S.), Huawei (Japan), Extreme Networks (U.S.), ZTE Corporation (China), Fortinet (U.S.), Wi-Fi Spark (U.K.), and Boingo Wireless (U.S.). The global enterprise Wireless Local Area Network (WLAN) market is expected to grow from USD 5.53 billion in 2016 to USD 21.10 billion by 2021, at a Compound Annual Growth Rate (CAGR) of 30.7%. The rapidly growing market for enterprise WLAN technology is expected to influence the cloud technology as well as Internet of Things (IoT) market, and thereby considerably increase market competitiveness. Moreover, technological advancements are expected to increase WLAN applications in numerous industry sectors. Among enterprise WLAN hardware, the access points segment has the fastest growing market during the forecast period. The introduction of wireless access point technologies in the industrial environment is a challenging goal, with high potential benefits on increasing flexibility and reduced costs; this is basically true for industrial automation and robotics. In the automation scenario, there are several solutions available, and IEEE 802.11n is a standard that overcomes most of the constraints on the part of automation. In enterprise WLAN, an access point is a device that allows wireless devices such as smartphones and tablets to connect with a wired network using Wi-Fi. The WLAN access point is forecast to be one of the highest growth segments in the enterprise WLAN market. Among enterprise WLAN market by service, the professional services segment is the largest contributor during the forecast period, whereas the managed services segment is expected to grow at the highest CAGR. With increase in the number of mobile devices connecting to the wireless network, users have started using an increasing number of bandwidth-intensive applications, which in turn has led to decrease in the efficiency of networks. To maintain bandwidth and latency of the network to provide efficient and effective services to end-users, it becomes very important to manage and optimize the services of enterprise WLAN. The municipality and public infrastructure vertical is the fastest growing vertical in the enterprise WLAN market. The municipality and public agencies have the incomparable challenge of protecting operational information as a matter of national security. These mission-critical environments cannot afford to have downtime in networks. Through the solutions in enterprise WLAN, the agencies can keep track of the issues before a problem arises. The dashboards available in enterprise WLAN solutions such as traffic analyzer, configuration management, and performance monitoring can be used as automated network tools for solving such problems. The increasing mobility in businesses due to the rapid adoption of many WLAN trends, such as Bring Your Own Device (BYOD) is driving the evolution of the enterprise WLAN market. The organizations in the education segment need a reliable network environment. These networks must be stable to provide users access to mission- critical applications and regulate the usage of network for personal content. What are the upcoming industry trends for Enterprise WLAN? 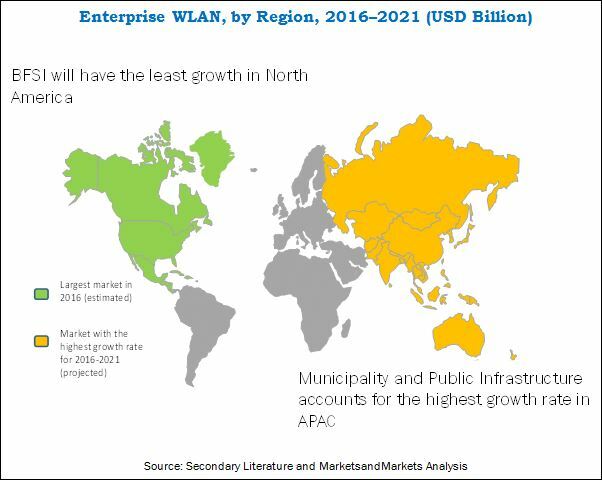 Among regions, North America is projected to have the largest market share and is expected to dominate the enterprise WLAN market from 2016 to 2021. Correspondingly, during the same period, APAC is expected to showcase a significant growth potential and is projected to grow at the highest CAGR for the market. This is backed by the existence of a large population, increasing customer awareness, developing technology hubs, and affluent countries such as South Korea, Singapore, and Hong Kong. However, due to lack of awareness, expertise, and other operational challenges, most of the organizations struggle to optimally utilize the full potential of enterprise WLAN technologies. This has been significantly hindering the growth of the market. Technological giants such as Huawei, Juniper, and Cisco Systems have adopted various growth strategies such as new product launches, partnerships, contracts, collaborations, acquisitions, and expansions to expand their global presence and increase their market shares in the global Enterprise WLAN market. 9.4 Huawei Technologies Co. Ltd. Figure 96 Moon Chart for Cisco Systems, Inc. Figure 98 Moon Chart for Huawei Technologies Co. Ltd. Figure 101 Moon Chart for Ruckus Wireless, Inc. Figure 103 Moon Chart for Dell Inc.